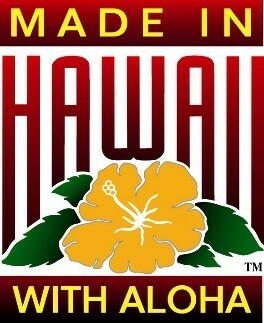 The Made in Hawaii with Aloha branding program (MIHA) is managed by the Hawaii Department of Agriculture (HDOA) and is promoted jointly by HDOA, Hawaii Department of Business, Economic Development and Tourism (DBEDT), and the Chamber of Commerce of Hawaii (CoC). The MIHA branding program was established to protect the integrity and value of authentic Hawaii branded products and to identify those products made in Hawaii from products made elsewhere yet called made in Hawaii. Products labeled with the MIHA logo comply with the provisions of Hawaii Revised Statutes (HRS) §486-119 Hawaii-made products; Hawaii-processed products (see below). HRS §486-119 Hawaii-made products; Hawaii-processed products. (a) No person shall keep, offer, display or expose for sale, or solicit for the sale of any item, product, souvenir, or any other merchandise that is labeled “made in Hawaii” or that by any other means misrepresents the origin of the item as being from any place within the State, or uses the phrase “made in Hawaii” as an advertising or media tool for any craft item that has not been manufactured, assembled, fabricated, or produced within the State and that has not had at least fifty-one per cent of its wholesale value added by manufacture, assembly, fabrication, or production within the State. (b) Subsection (a) notwithstanding, no person shall keep, offer, display, expose for sale, or solicit the sale of any perishable consumer commodity that is labeled “made in Hawaii”, “produced in Hawaii”, or “processed in Hawaii” or that by any other means represents the origin of the perishable consumer commodity as being from any place within the State, or use the phrase “made in Hawaii”, “produced in Hawaii”, or “processed in Hawaii” as an advertising or media tool for any perishable consumer commodity, unless the perishable consumer commodity is wholly or partially manufactured, processed, or produced within the State from raw materials that originate from inside or outside the State and at least fifty-one per cent of the wholesale value of the perishable consumer commodity is added by manufacture, processing, or production within the State. Violations may result in the penalties set forth in chapter 486, Hawaii Revised Statutes, including but not limited to, the imposition of civil and administrative fines of up to $2000 per day or for each separate offense and the issuance of stop-use and stop-sale orders. Access an application form here (hyperlink to cloud based fillable e-sign form) to provide the required information. Duplicate the worksheet as necessary to certify multiple items. HDOA staff will review the submitted documents and contact you with questions or if more information is necessary. HDOA Chairperson will review the application for approval. Upon approval, HDOA staff will send the approved form, and a link will be provided to download the logos for use on products or as an advertising or media tool for products that have been manufactured, assembled, fabricated, or produced within the State and that have had at least fifty-one per cent of its wholesale value added by manufacture, assembly, fabrication, or production within the State. HDOA welcomes questions and comments about the MIHA branding program.